Home » Wellness Guide » The Basics of Healthy Eating » How super are your Fruits? How super are your Fruits? Superfruits are touted as having nearly mystical abilities that can stop cancer in its tracks, prevent heart disease, clear up your skin, prevent aging, lose weight… the list goes on. With a reputation that borders that of patent-medicines, it does not take an expert to question whether or not Superfruits are all they are hyped up to be. As you are working on enhancing your health through the help of a weight loss program, it is important to be weary of the snake oil and focus on proper nutrition. The term superfood is somewhat recent. It was coined in 2005 by a nutrition expert that was trying to get the word out about the many benefits of eating nutritionally dense fruits and vegetables. The word has since evolved, and many people now refer to items as superfruits instead. There are a lot of other superfruits that are advertised, and many of them are exotic and expensive. While these nutrient packed foods are generally both healthy and tasty, it can be damaging to assume that they are going to cure all of your health problems. Are Superfruits a Healthy Choice? It is true that these fruits are a healthy snack option, but that is not to say that other fruits aren’t healthy as well. In fact, munching on vegetables is an incredibly healthy snack, but you don’t hear the term “superveggies” circulated around the gym—it just doesn’t role off the tongue. That is part of the reason that superfruits are so popular right now. It is fun to think that fruits have a mystical power, like a super hero. We want to believe that eating sweet berries all day or drinking delicious fruit juices is going to cause us to wake up and be twenty pounds (and years) lighter. This is where superfruits become a bit misleading. Losing weight requires commitment outside of adding nutrients to your diet. 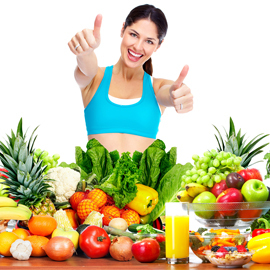 Eating more fruits and vegetable is a great step to take as you are focusing on your health, but it is just one step that you will need to make towards maintaining a healthier lifestyle.